Everyone knows that Sushi is famous in Japanese cuisine. It is basically vinegar flavoured cold cooked rice served with a garnish of raw fish, eggs or vegetables. 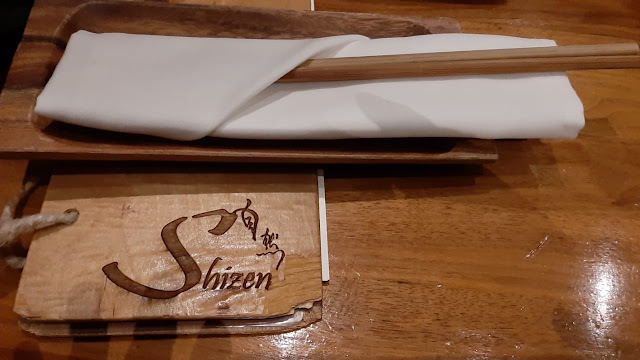 Generally, one associates sushi with raw fish but I recently had the opportunity of trying out vegan sushi when we dined at the Shizen Vegan Sushi Bar & Izakaya in San Francisco, California. 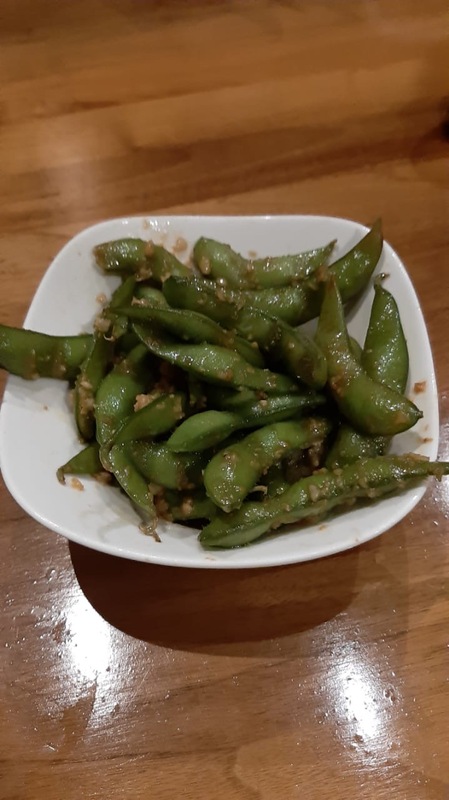 This restaurant which is extremely popular is located in 14th Street and is famous for its vegan fare and faux sushi. One has to make sure you have a booking before going there, especially in the evenings when it is full of young people grabbing a snack/drink/meal on their way back from work. sauteed with garlic and soy reduction. It tasted almost like a flavourful masala! 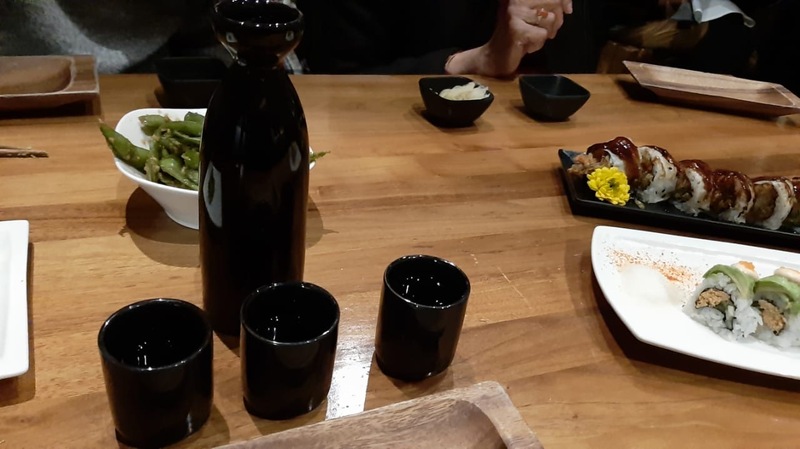 We ordered the conventional Sake (Rice Wine) to go with our meal. This is the traditional Japanese alcoholic beverage made by fermenting the rice. There was so much to choose from in the menu! 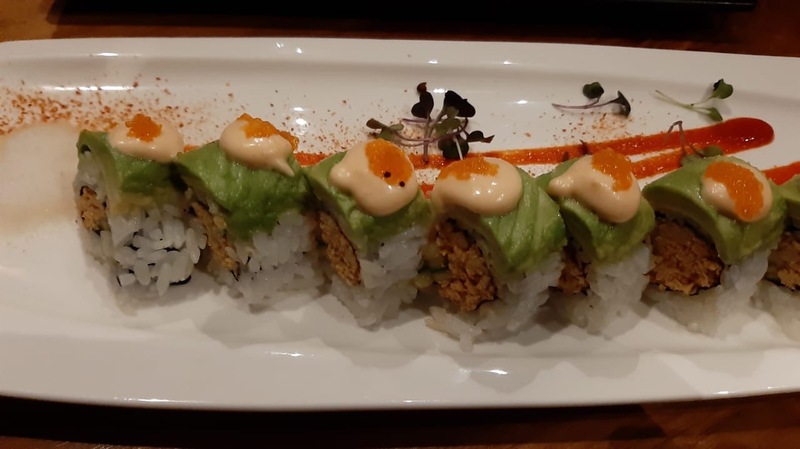 Finally we decided to have three different types of Vegan Sushi. The first was called Candlelight and it was served with a burning flame. 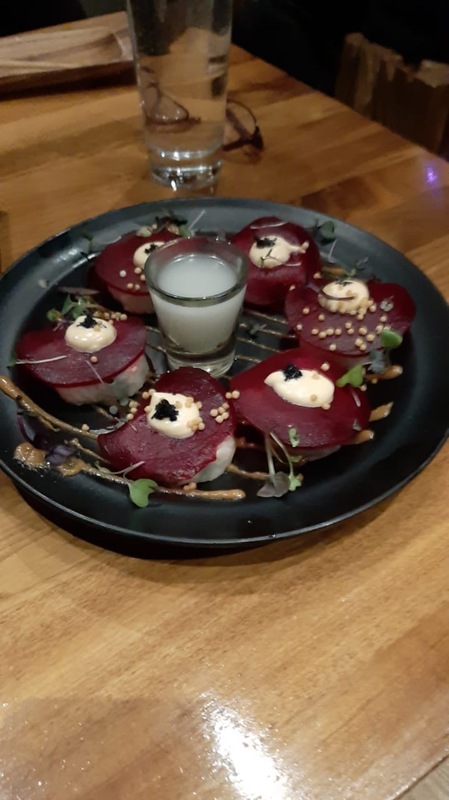 I was delighted to see the food plating - the red in the following picture is a hot sauce that accompanies the sushi. This had spicy tofu, avocado, cucumber, seaweed pearls, shichimi togarashi and fire! The shichimi togarachi is a common Japanese spice mixture with some seven ingredients. I must say this Candlelight was truly delicious. Of course, along with all the sushis we had another dip made with ginger and soy. Giving the chopsticks a try! 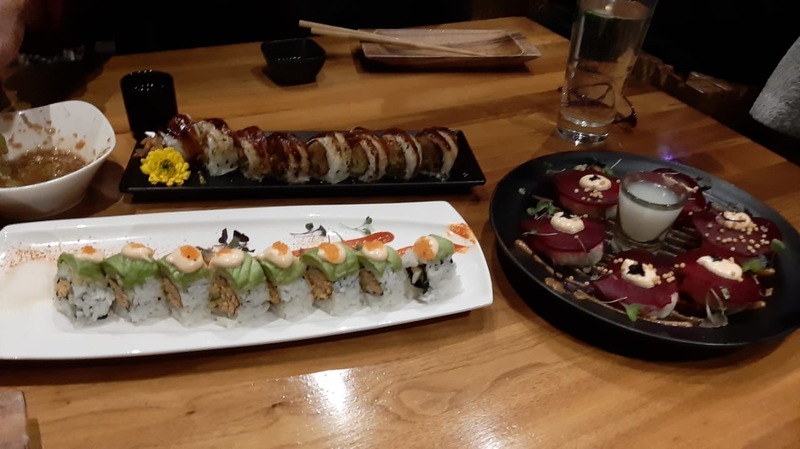 The next type of Sushi was called The Hidden Agenda and it was as delicious as the first! 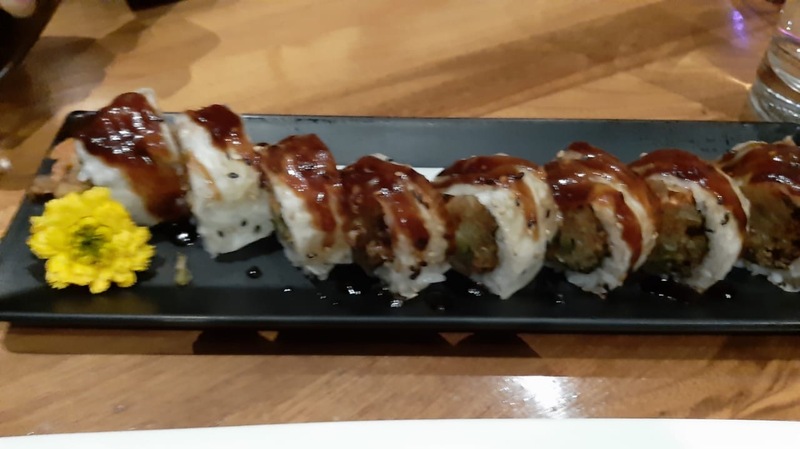 This one was made with tempura eggplant, bell peppers, zucchini, carrot, yellow onion, garlic aioli and sweet soy sauce. The last of the sushis was by far the most interesting. This was so appropriately called The Surprise Ending. This sushi was made with beets, kale, avocado, asparagus, shredded tofu, yuba, rice crackers, seaweed pearls, spicy aioli, and suspense!! There were six pieces of sushi out of which one is extremely spicy. There is no indication which of the six is this one. It's the luck of the draw and anyone of the diners can get this. I happened to get this at our table. It was fiery hot and as per the tradition I had to gulp down the Sweet Sake served with it at one shot! I am happy to report that I managed to do this successfully! For dessert, we settled for the Chocolate Brownie with Ice Cream served with Strawberries and Sweet Fried Banana Fritters which provided a perfect end to a wonderful dining experience. 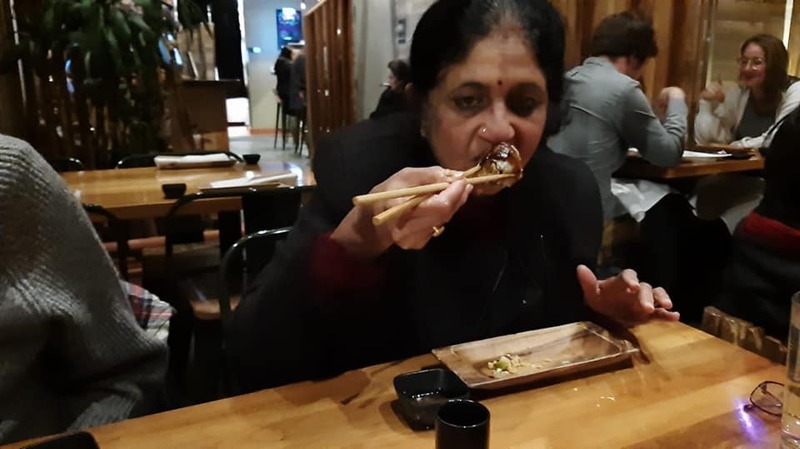 I would like to thank my son, Nitin for taking us there and guiding us through what for us was an unique dining experience.